Hair Straightener Poisoning is the accidental or intentional intake of any product containing the compound. An exposure can also take place inadvertently when the lotion affects the skin or eyes. What is Hair Straightener Poisoning? What are the Causes of Hair Straightener Poisoning? What are the Signs and Symptoms of Hair Straightener Poisoning? How is First Aid administered for Hair Straightener Poisoning? Who should administer First Aid for Hair Straightener Poisoning? 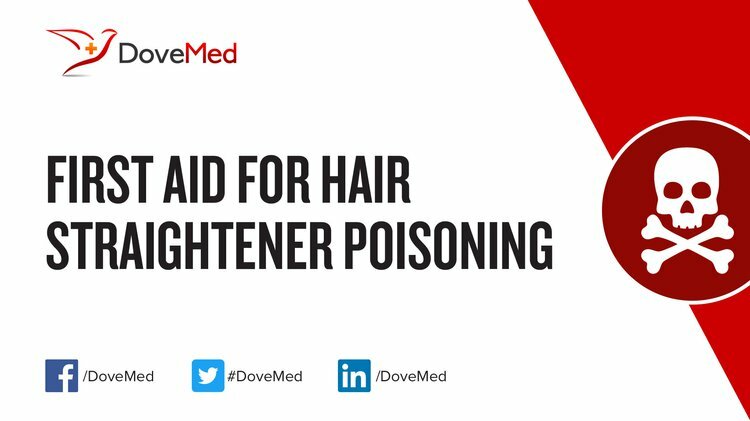 First aid for Hair Straightener Poisoning is administered by healthcare professionals. What is the Prognosis of Hair Straightener Poisoning? How can Hair Straightener Poisoning be Prevented? Rahali, Y., Benmoussa, A., Ansar, M., Benziane, H., Lamsaouri, J., Idrissi, M. O. B., ... & Taoufik, J. (2011). A simple and rapid method for spectrophotometric determination of bromate in bread. Electronic Journal of Environmental, Agricultural & Food Chemistry, 10(1). Idrissi, M. O. B., Draoui, M., Zahidi, A., & Taoufik, J. A simple and rapid method for spectrophotometric determination of bromate in bread. Robbins, C. R. (2012). Reducing Human Hair Including Permanent Waving and Straightening. In Chemical and Physical Behavior of Human Hair (pp. 205-262). Springer Berlin Heidelberg. ALLI, L. A., NWEGBU, M. M., INYANG, B. I., NWACHUKWU, K. C., OGEDENGBE, J. O., ONAADEPO, O., ... & ONIFADE, E. A. (2013). International Journal of Health & Nutrition. Int J Health Nutr, 4(1), 15-20. Cohen, D. E., Price, A., & Ramachandran, S. (2015). Contact Dermatitis and topical agents. Cosmetic Dermatology: Products and Procedures, 52. Rokaya, H. A. S., Abulyazid, I., & Thanaa, M. S. B. (2012). Protective effect of cape gooseberry fruit against mutagenicity of potassium bromate in mice. J Am Sci, 8, 22-29. Otuechere, C. A., & Farombi, E. O. (2012). Journal of Chemical and Pharmaceutical Research, 2012, 4 (7): 3676-3683. Journal of Chemical and Pharmaceutical Research, 4(7), 3676-3683. Rehman, M. U., Tahir, M., Khan, A. Q., Lateef, A., Khan, R., Hamiza, O. O., ... & Sultana, S. (2012). Methanolic extract of Bacopa monnieri protects against KBrO. Journal of Pharmacy Research Vol, 5(11), 5231-5238. Campbell, K. C. (2006). Bromate-induced ototoxicity. Toxicology, 221(2), 205-211. Karbownik-Lewińska, M., & Lewiński, A. (2010). Protective effects of melatonin against oxidative damage of macromolecules caused by selected potential carcinogens. Folia Medica Lodziensia, 37(1), 57-67.